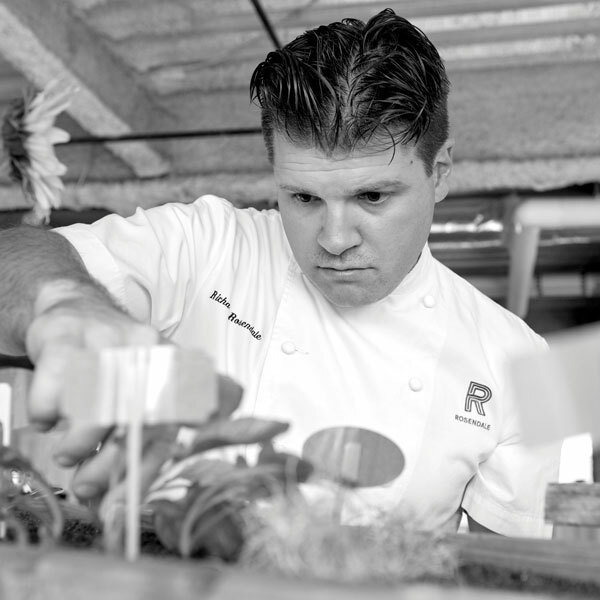 Rich Rosendale’s style of cuisine reflects his experiences from his childhood growing up in Pennsylvania to his worldly experiences competing against some of the top chefs around the globe. Chef Rosendale’s origins in cooking were nurtured and influenced at an early age by his Italian and German grandmothers. From the front porch of his grandma’s house in Somerset, Pennsylvania, shucking peas, to the world stage of the most elite cooking competitions, Chef Rosendale offers a wealth of experience. As a certified master chef, a distinction earned through the American Culinary Federation, he is among an elite group of 67 chefs to have ever successfully passed the grueling 130-hour cooking exam held at the Culinary Institute of America in Hyde Park, New York. The rigorous test has a 90 percent fail rate, and Chef Rosendale is the youngest to ever pass the exam. He’s also a formidable culinary competitor, with more than 55 international cooking competitions under his belt. The Bocuse D’Or is considered the most demanding five-hour cooking competition in the world, and to prepare Chef Rosendale mentored and trained with top chefs from around the country, including Thomas Keller, Daniel Boulud, and Grant Achatz. He was the USA Champion in 2012 and earned the right to represent the United States the following year in Lyon, France, where he cooked against 22 other countries, finishing in the top third of the field. Few chefs ever have the opportunity to cook at this level. The most internationally competitive chef brings the cooking experience home, bringing his expert perspective to the novice cook so they to can use his easy tips, tricks, and techniques in their kitchens. Chef Rosendale can be seen every Saturday morning on CBS where he, host Evette Rios, and chef Vikki Krinsky rehab a family’s unhealthy dish to create something that is delicious, nutritional and easy to make. Chef Rosendale is the founder of Rosendale Collective, the innovative company behind his catering, consulting, restaurant partnerships, and training services. From D.C. to Dubai, he brings a passionate attention to detail and over 18 years of elite industry experience to create customized experiences and winning business solutions. He has opened numerous restaurants over the years and enjoys cooking for people to put a smile on their faces. Although he has cooked for presidents, foreign dignitaries, and celebrities around the world, his favorite meals are with his family. Chef Rosendale and his wife, Laura, are the parents of three children: Laurence, Liam, and Francesca.